We are reading In Search of a Homeland: The Story of the Aeneid for our historical literature. For our music studies this year we are reading (and listening) about opera and ballet music, stories, and performances. 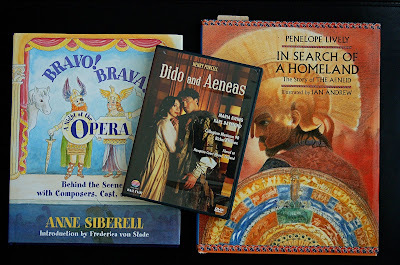 I picked up a DVD performance of the opera Dido and Aeneas. I just love it when things come together like that!! 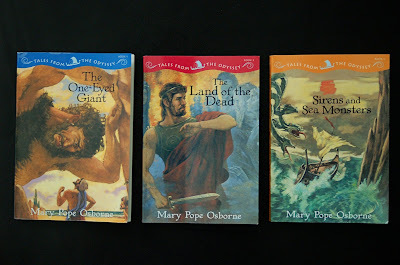 Levi also read through the first three books in Tales From the Odyssey by Mary Pope Osborne. This series retells selected stories from Homer's Odyssey. These chapter books also include information about Homer and the Odyssey, a map of Odysseus' journey, and a list of the names, pronunciations, and sketched pictures for the main gods and goddessess. They are a terrific introduction to the Odyssey as read-alouds or can be read alone by the child reading beginning chapter books.